Happy Monday, hope you had a great weekend! 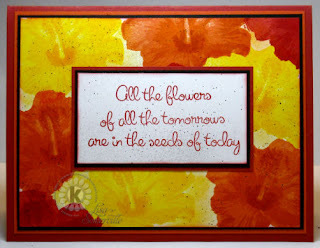 It's Kitchen Sink Day, today I have a colorful card created with the Kitchen Sink 3 Step Hibiscus to share with you. I used the Triple Dimension Technique for the background, kinda reminds me of some colorful DSP. I used the a Chocolate Chip Marker and the Spritz Tool to add some flecks to the main image and the sentiment. Don't forget you can save 10% on your Kitchen Sink Stamps purchases, just enter code LISA10KSS at checkout. Love this exquisite blanket of hibiscus!! Such vivid, bright colors!! Beautiful, beautiful work, Lisa! Wow! The hibiscus flowers are so pretty and vivid!! What a gorgeous card, Lisa!! You're right, it does look like some fabulous DP. I love the bright colors you chose, it went along well the the beautiful sunshine we're having today. WOW! This is gorgeous, Lisa--looks just like designer paper! The colors are so vibrant. Beautiful, vibrant colors! Gorgeous card, Lisa!